The O'Neill Psycho 7mm Mitten Gloves supply tropical warmth for your hands as you seize the ice cold splendor of empty peaks in near arctic conditions. Starting with 7 comfy millimeters of UltraFlex neoprene, these cold water surf mittens are held together using super strong glued and blind-stitched seams, and then fused with a liquid seam seal for unbelievable warmth. The mitten design concentrates the warmth in your hands while leaving your thumb with full mobility. 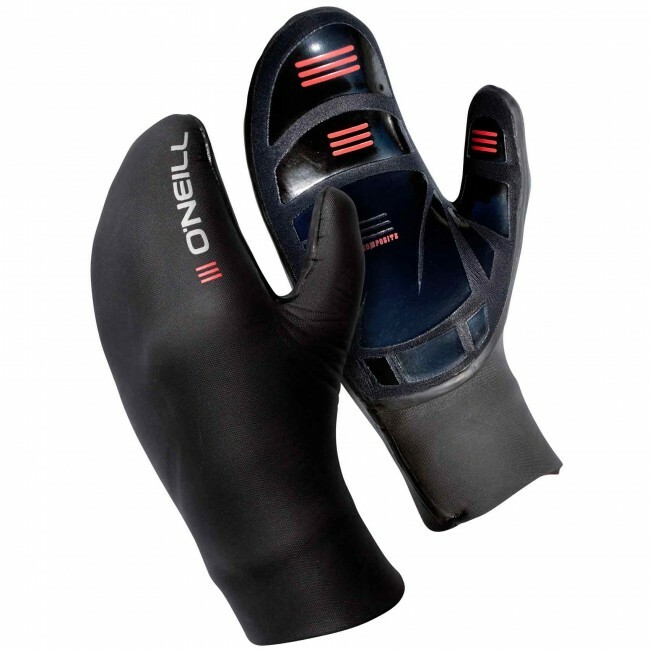 Submerge yourself in the comfort of the O'Neill Psycho Gloves for quality and value, paired with high end performance. Good gloves and boots are a must in the northeast winter surf. I have tried all the top brands over the years, but it it has been the O'Neill Psycho 7mm that fits and does the job best to me. All winter mitts wear out due to the wax and our pulling at them to get them off; just happens, but what I have found with these mitts is that the inessential part of the glove (extra grip stuff) goes long before any compromise to the rubber that keeps my hands toasty. In fact, I only replaced my last pair due to a tear I made up my the wrist pulling gen off, not due to any leaks in the palm area which I always get with other brand I have used in the past. Love these mitts! For East Coast winters, there's really nothing better to keep your fingers warm. If you've ever gotten the "frozen barfies" because your hands got too cold, you never will again with these gloves. Mine haven't ripped, and I actually like them better than the 5/3 flashbombs I have. These create a better wrist seal with my suit. I went a size up and they fit great. I bought these to replace my worn out Rip Curl Flash Bomb 7/5 Mitts because the Rip Curl mitts were out of stock. The first pair of O'Neill mitts on the first time I put them on the rubber tore right on the wrist while pulling them on. I returned those mitts and Cleanline replaced them with another pair of O'Neill mitts. The second O'Neill mitts tore in almost the same place as with the first pair. Bottom line don't buy these O'Neill mitts. Do yourself a favor and get the Rip Curl. Special thanks to the Cleanline crew for helping me out with the exchanges! !